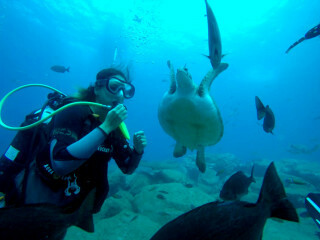 Learn to scuba dive in the mesmerizing waters of Tenerife, reaching a depth of up to 12 m (40 ft). Minimum age to participate is 10 years old. Starting time: 9:00 a.m., 12:00 p.m., and 3:00 p.m.
What to bring? Towel, warm clothes for after the activity, sunscreen, and water. Bathrooms and showers are located in the dive center. You need to have basic swimming skills and be comfortable in the water. If you are on continuous medication, please consult a doctor. You can cancel up to 24 hours in advance with 100% reimbursement. We cannot reimburse later cancellations. In case of cancellation from our side for the reason of unfavorable weather conditions including waves, we will agree on a different time or return your full payment. If you’ve always wanted to try scuba diving but weren’t ready to take the plunge and go for a certification course, Discover Scuba Diving is for you. This is your first introduction to what it takes to explore the underwater world. You only need some swimming skills, good physical health, and to be at least 10 years old. In this course, your instructor starts with a brief theoretical explanation regarding equipment and safety. After you finish this part of the course, you go for a short shallow water tour to practice what you’ve just learned. Once you get comfortable with breathing underwater and looking around at your surroundings, you are ready to go diving in the ocean. Your instructor takes you to the diving spot via a cool sailboat ride. 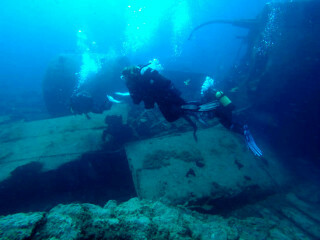 Afterwards, you jump in the water with your gear and begin exploring the underwater world of Tenerife. The water temperature in Tenerife is agreeable year-round, ranging between 13°C in the winter and 25°C during summertime. The transparent sea guarantees visibility of up to 30 m (98 ft). 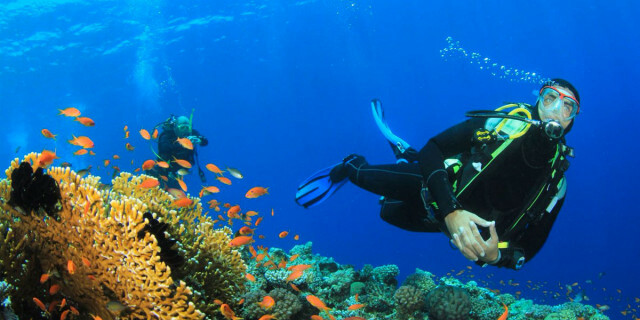 The calm marine currents of the sea also help make this diving experience pleasant and easy. Once you are submersed, you have the chance to see volcanic formations with wrecks, caves, drop-offs, overhangs, tunnels, and canyons, depending on the spot we visit. 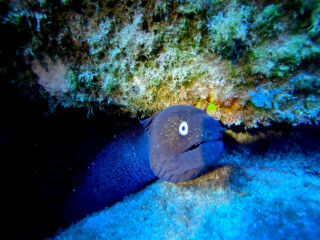 You observe the diverse marine life, with incredible species, such as rays, turtles, groupers, barracudas, and nudibranchs. Moving below the surface is an incomparable, wonderful thrill. When your diving session ends and you begin your speedboat journey back to the shore, you may even be able to spot whales and dolphins swimming nearby. The extraordinary view of Tenerife’s volcanic topography, as well as its rich marine life, is a memorable experience that guarantees you’ll be looking forward for your next diving adventure. 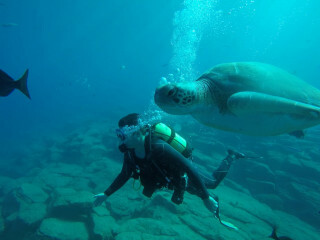 Learn the basics of scuba diving in the sparkling blue waters of Tenerife, and get closer to sea life than ever before. 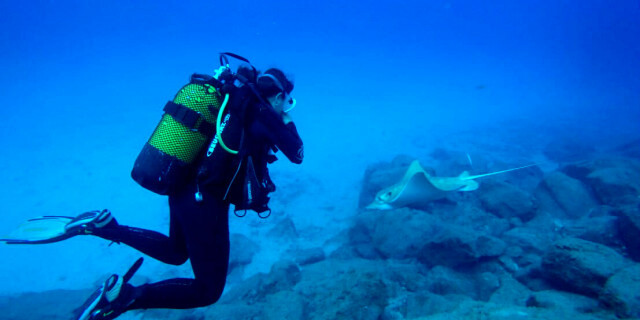 Explore amazing diving spots, fantastic marine life, and the impressive turquoise sea of Tenerife. 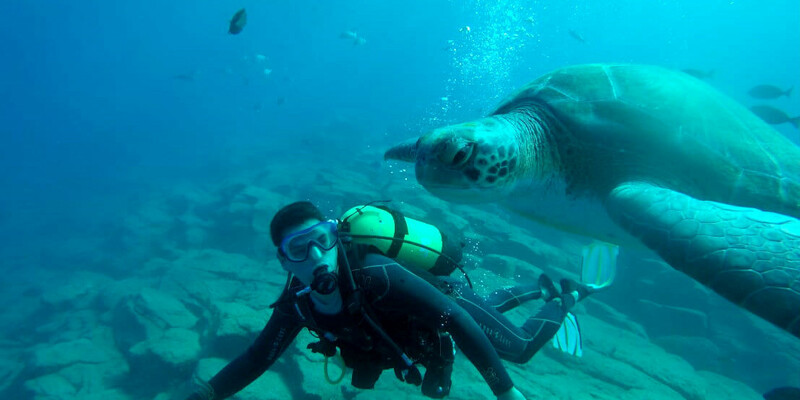 Explore the turquoise water of the Tenerife coast and get to know some endangered species of turtles.